Jade has a pretty great collection of books. My mom has a deep love for children's books and has contributed significantly to Jade's large collection. I've heard that one of the ways to develop a love for reading in a child is to have several books on hand. I love that I often find Jade looking through her book shelf, flipping through pages, and the fact that she will now pick out the ones she wants to read. We have a bookshelf we keep in her room with most of her books, but I find myself bringing out seasonal books to the living room. Here are some that we have in our living room for easy spring reading access. These would be great if you are still putting together your child's Easter basket. This cat just can't let the Easter Bunny get all of the attention...so he devises a plan to put the attention back on him! A quick read that is great for toddlers. A sweet book for Mother's Day that will make you feel all the feels with your first born. This is a book about the dangers of hoarding and will convince your child to live a life of minimalism...just kidding...kind of. It's super cute. This book is so SWEET (especially if you've ever owned a dog and know just what big, jealous BABIES they can be). Fletcher the dog is jealous when baby chicks on his farm hatch and his owner, Alexandra, gives them the attention needed. So he and his friends create a giant egg that he can "hatch" from. The giant egg becomes the talk of the town and Alexandra finds her beloved Fletcher when he hatches at the end. This is a compilation of several Beatrix Potter stories with Peter Rabbit, Tom Kitten, Benjamin Bunny, Mr. Tod, and more. I read these when I was a little girl and had an accompanying video that I watched with all of the characters. These are classic stories! All Hoppi the bunny wants to do is help the Easter Bunny deliver his goodies on Easter morning. To do so, he has to create the best Easter egg. After not much luck, Hoppi does a great act of kindness that catches the Easter bunny's eye. A classic with all kinds of Dr. Suess silliness! This is about a little bunny family who dreams of all the different things their tiniest bunny may grow up to be. Do you read any of these? 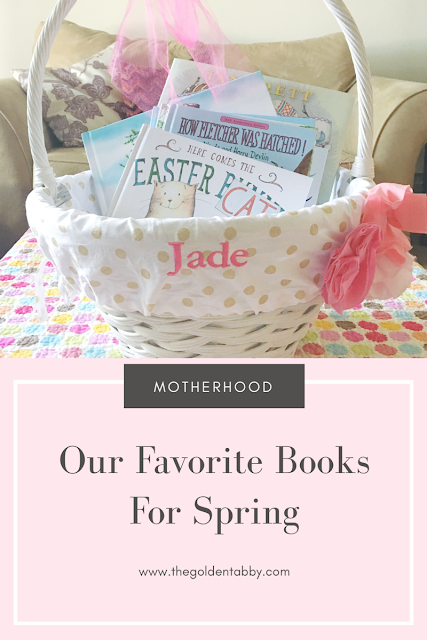 What books are you and your little ones loving for Spring? So many great books! I'll have to order some of these! I love Beatrix Potter stories! Thanks for sharing!